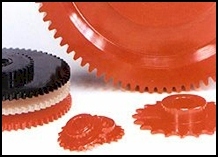 Polyurethane sprockets made by American Urethane are superior to metal sprockets both for original design and replacement for drive gear designs and similar drive systems. In addition, polyurethane sprockets have lower tooling costs and can save up to 50% compared to metal sprockets. Drive gear systems using polyurethane sprockets offer excellent wear and reduced downtime. Polyurethane sprockets also have unique noise abatement properties not possible with metal parts resulting in quieter operating machines. 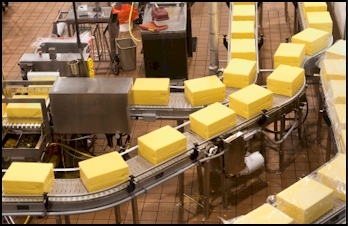 Dozens of industries use polyurethane sprockets in their factory production to improve the efficiency of their conveyor belts or production lines. 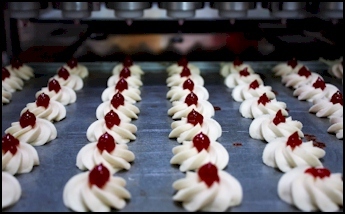 Many of these industries such as food production and health products specify polyurethane sprockets since polyurethane is FDA approved and resistant to harsh environments from heat, chemicals, solvents and abrasion.